The following are available options to pre-register for the tournament. 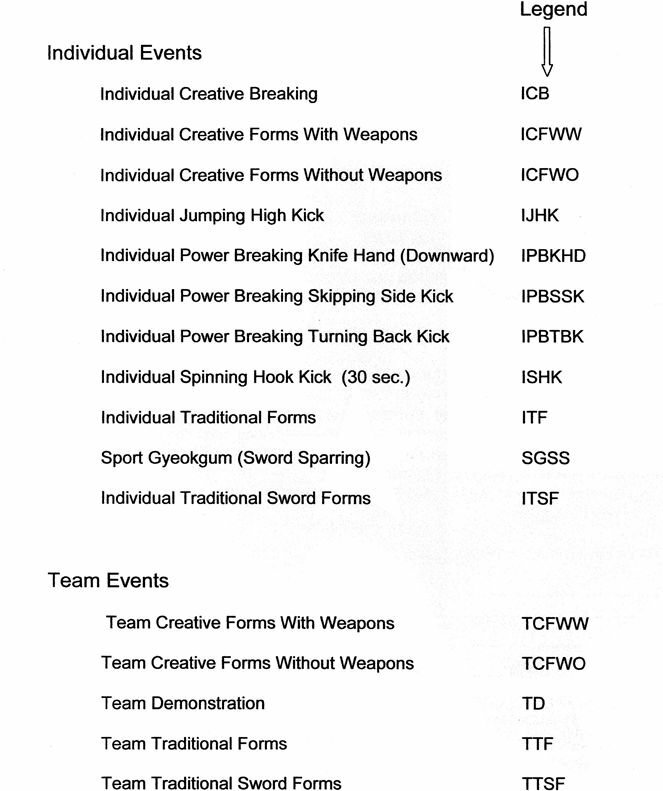 Email: Download the application, fill out completely and send to: ftwinternationaltkd@gmail.com. Late Registration (any day after October 20) will be accepted. There will be an additional $10 charge for each event entered. On Friday, October 26, 2018, you can register in person at the main lobby of the Sheraton Hotel in Downtown Fort Worth from 3:00 pm to 9:00 pm. Special Tournament Room Rates are available. (CASH ONLY - An ATM is located inside the main entrance of the convention center). Any available metered parking spots are free on the weekends. Other paid parking lots are all around the convention center. These can be purchased the day of the tournament at the main area ticket window. 3:00 - 9:00 pm Late Registration at the Sheraton Hotel Downtown Fort Worth - 1701 Commerce Street, Fort Worth, TX 76102. $10 late fee for each event will be charged. 6:00 - 9:00 pm Free Referee Seminar at the Sheraton Hotel. 7:00 am All referees, medical team, and organizing committee members must attend a meeting in the Official’s Meeting room at the Convention Center. 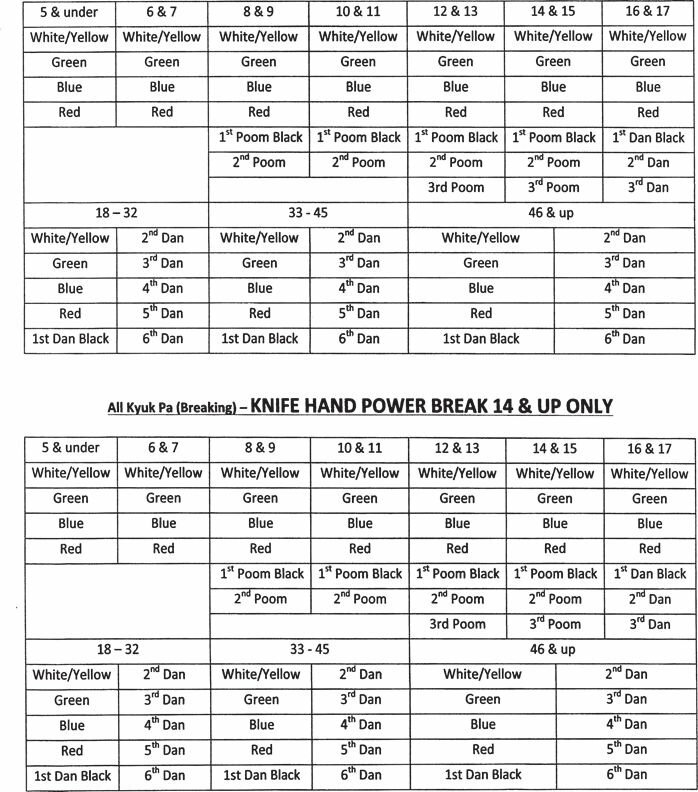 Holding Area will begin grouping competitors officially at 7:30 am, however, after 7:30 any times are approximations based on # of total competitors and overall tournament flow. Actual competition times will vary. * No Weigh-In Required for Senior men and women ages 33-39 and Executive senior men and women ages 40 -49, 50 & up. Fist Gloves (15-17 and 18-32 years old Black Belts are required to wear WTF/USAT approved Taekwondo gloves. Gloves may be red, blue or white. If red or blue color, must correspond with the chest protector. Gloves are optional for all other divisions). Kicking technique should be followed as in the Kukkiwon textbook. Targets used in breaking events must be those authorized by the Organizing Committee. In principle, the foot cannot be covered by bandages or any other materials. Use of any materials covering the foot due to injury must be approved by the Referee. Side Kick breaking must be done with the sole of the foot or outer part of the foot. The height of breaking materials must be higher than the contestant's waist. Breaking is conducted only once. Contestants are permitted to lift one foot off of the ground while applying their technique. Contestants are permitted to apply their technique using either their front foot or back foot. Exceeding the contest time: Deduct one point for each ten seconds. The competitor's name is different than what is on the Contestants List. Method of contest: Ranking system based on scoring criteria below. Maximum amount of boards is 10. The minimum is 1. No alterations are allowed. Such as adding a board fragment. Each board may be attempted to break three times. Grandmaster Won Chik Park, founder and tournament director, created this championship in October of 1981. The early tournaments were held at Texas Christian University (TCU) in Fort Worth, Texas.. As the tournament grew and grew, every year, it became necessary to move the tournament to a larger venue. The new home became the Fort Worth Convention Center in 1986 and has been held there ever since. 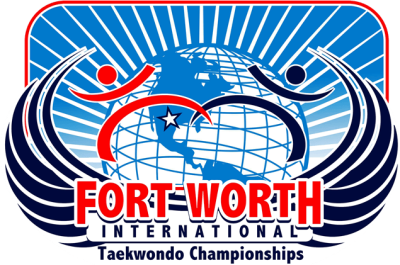 In 1997, the tournament’s name was officially changed from the Fort Worth Invitational to the Fort Worth International Taekwondo Championships. Modifying the tournament to an international event has given the champions valuable international recognition and exposure. 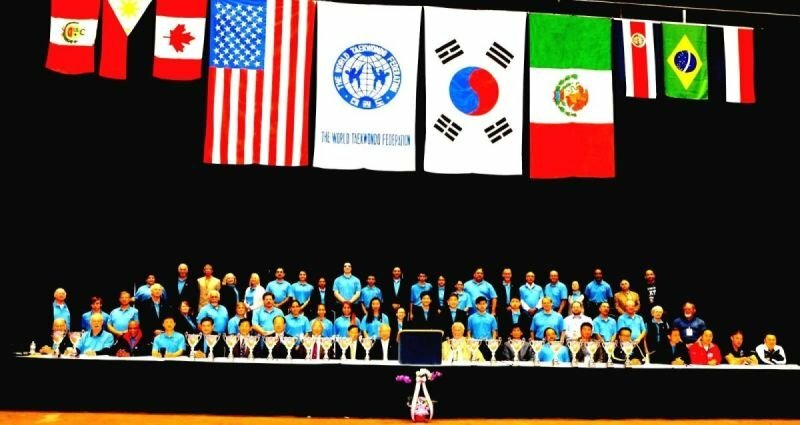 As word of this change made its way around the national and international communities, the event has drawn ever-increasing numbers of participating nations, making Fort Worth a great Taekwondo city and the United States a leader in martial arts interest and championship tournament participation. What has remained consistent is the same work and dedication that goes into the planning and production of this tournament each year, making it one of the largest Taekwondo championships in the United States,. The tournament is recognized by the World Taekwondo Federation and supported by the Texas Taekwondo Association. Grandmaster Won Chik Park began his training at Taekwondo Ji Do Kwan Pusan Do Jang in 1954 under Grandmaster Hyon Jong Park in Pusan, Korea. He has over 50 years experience teaching Taekwondo and holds the rank of 9th Degree Black Belt (Dec 15, 1993) by Kukkiwon and World Taekwondo Federation in Seoul, Korea. This is one of highest rankings in the World. Grandmaster Park is also founder and former president of the United States Taekwondo Grandmaster Society, a non profit organization working to establish the United States Taekwondo Museum and Hall of Fame, among other missions; a facility which will examine and reveal the history of the ancient martial art of Taekwondo, as well as the Korean culture from which it emerged. 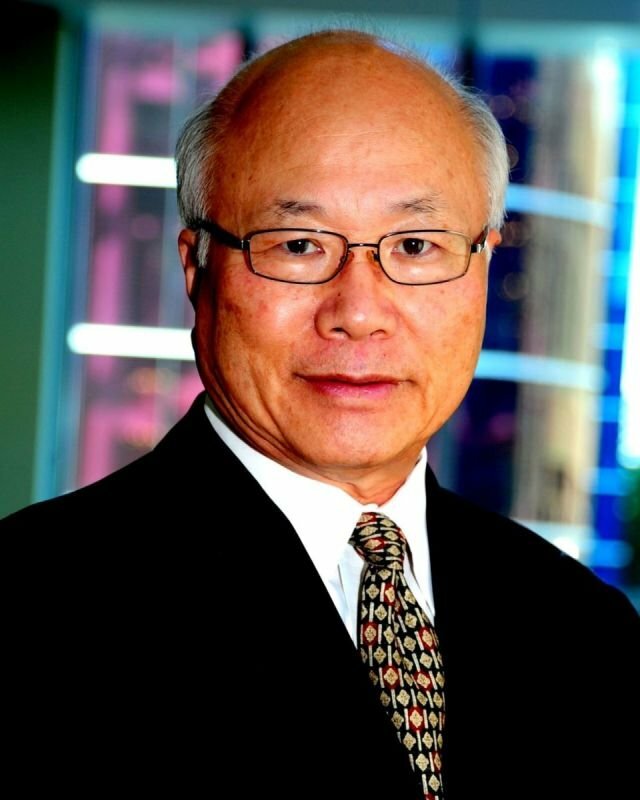 The Dallas-Fort Worth community find ourselves particularly fortunate to have Grandmaster Park, with his vast experience and wisdom, in our midst. He has given his life to Taekwondo and hopes that he leaves a lasting legacy to the sports he loves. What rules and regulations does the tournament follow? What equipment is mandatory for the tournament? - Approved chest guard, headgear, shin-instep guard, forearm guard, protective cup, and mouthpiece. All competitors will supply their own protective gear. What safety measures does the tournament have in place? We have onsite medical staff throughout the entire day with an EMT on standby. We also have several police officers in attendance.